I received several positive comments on this piece. This three-paneled Rain Tree Wood Buddha face is masterfully crafted by local Thai artisan Thanat. Thanat uses manual tools to allow for the richly detailed artistry that embellishes this piece. This striking piece inspires relaxation and spiritual harmony, helping you connect with your home through authentic art. This is a beautiful piece for any room in your home. This carved art is really nice, I loved it! It is a little small but it would still look good where ever you put it. Looks like a museum artifact.. Even though a tad gaudy for my taste, I was able to place the panels away from a place of prominence on my shrine and still have gotten compliments on them. Even if they aren't culturally consistent with the other items, they follow the design flow, and thanks to living in the US, few people can tell the difference. Beautiful piece. Brought the whole room together. was much smaller then I was expecting did not think the price matched the item what it was worth. very small. about the size of apiece of paper. was very pleased withit but thought it would have been a little larger. "What are the specifications of each panel"
Hello AAsthana, each panel is approximately 7.28 inches wide x 10.24 inches long. Thank you for shopping with us! Because it radiates serenity. It appears to be beautiful and it is hand carved. I love the artwork and that it is hand carved. I am a yogi just getting into mantras and whatnot and peace has always come to me when around buddha images. "Can you pls make one in this color? 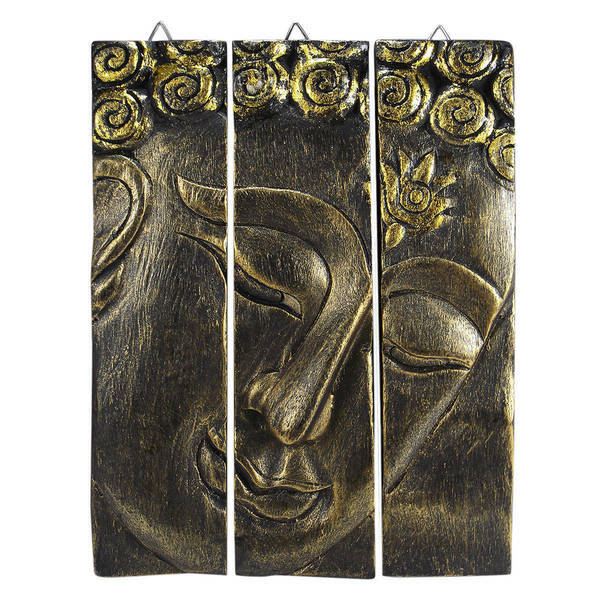 http://www.overstock.com/Worldstock-Fair-Trade/Full-Size-Acacia-Wood-Three-Panel-Buddha-Face-Thailand/2901147/product.html"
Hello Suma, unfortunately this item is out of stock. We currently do not have inventory to check, and cannot guarantee the item will be restocked. Thank you for shopping with us. "When looking at the pictures, the first one looks more black, and the second image looks more gold/brown. Is there a color option when ordering or its both the same?" Thank you for contacting us, kbjani. We only have the Gold Brown in stock. We apologize for the confusion we might have caused. Please let us know if you have any further questions. "is each panel 10x7 or all panels together?" Hello ksully86, the panels are individually 10.24 X 7.28. Thanks for shopping with us! each panel is 2 1/2" wide and 10" long so the total of this is 7 1/2 " wide and 10" long . very very small and not worth the price. lightweight wood able to hang it with tacks.